What Are The Best Adventure Slots Available Online? There is at least a little bit of adventure in every one of us. That is one reason why adventure is a major theme used by many slot developers. That is also why many players spend hours online looking for the best adventure slots to play. To help them we have searched through all available slot machines with the theme, and finalised a list of top 5 adventure themed online slots for the benefit of RoseSlots players. RTP, graphics and layout, prizes, features, and user comments are some of the factors taken in to consideration in compiling this collection. You are invited to read our introduction to each game and decide which ones would be ideal for you. Looking for El Dorado online slot is the ultimate adventure of the treasure hunter, and Jungle Jim braves all the dangers to find it for you. 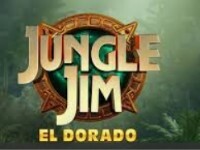 Whether Jungle Jim finds it or not, you will be rewarded for the time you spend on this slot machine with attractive graphics. Rolling Reels Feature awards you consecutive wins with a multiplier which goes up to a maximum of 15x. There is also a Scatter that awards Free Spins and Extra Free Spins. The RTP of this slot machine is an above-average 96.31%. 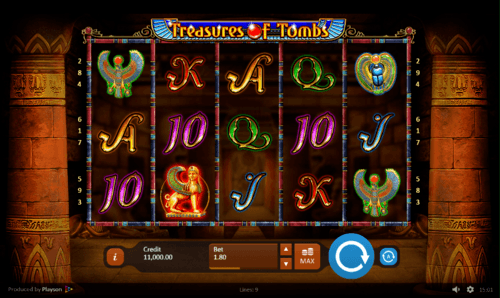 Enter the secret tombs of ancient Egypt filled with treasure and spin the symbols to find some impressive prizes in Treasures of Tombs slot machine with 9 paylines that comes with Playson reputation. There is a Bonus symbol which would replace all symbols to create winning combinations, and award you 10 Free Spins when you land 3 or more of them. The RTP of this slot machine is 95.08% but the top value symbol carries a maximum prize of 35,000 coins! 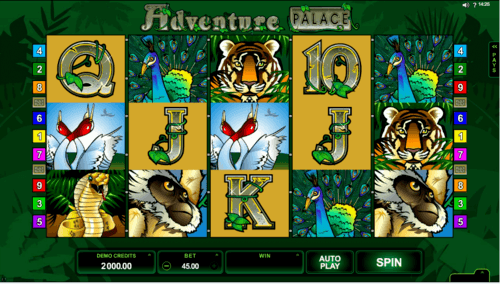 Win up to 150,000 coins as you explore the deep jungle in Adventure Palace slot that has comic style graphics. There are 9 paylines here, and the RTP is 96.1%, and if you want to play just for fun a minimum bet of £0.03 is available. The Scatter awards you up to 15 Free Spins which could be re-triggered during the feature but the best news is that all wins during Free Spins are paid 3x. You will also be delighted to hear that any win with the help of Wild is paid 2x. Attractive graphics, a beautiful girl, and ruins run over by the jungle are the keywords that would attract you to this game. With its RTP of 96.1% and 40 paylines, you will rewarded better than the average online slot game. 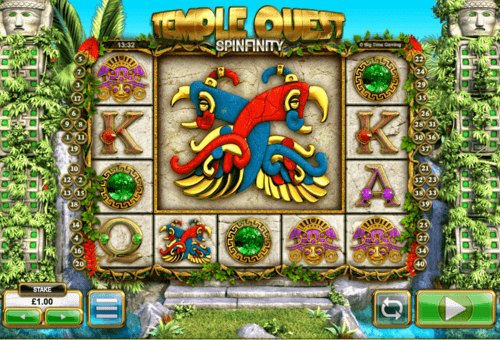 Mega Icons, if you land, Temple Quest Spinfinity will take the space of 16 symbols and create wins individually or in combination with other symbols, and the Scatter symbol awards 9 Free Spins. Be brave to enter the jungle, and you will leave with some impressive prizes. 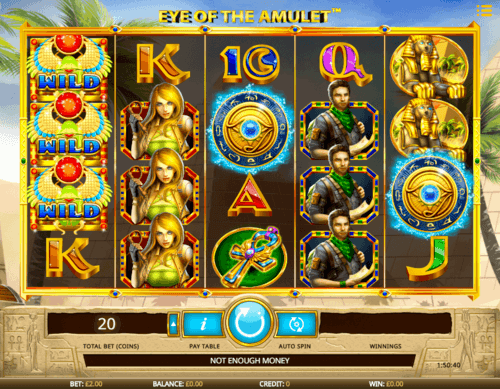 Explore the ancient Egypt and hunt the treasure that lies hidden for centuries as you enjoy the beautiful graphics of Eye of the Amulet slot. An above-average RTP of RTP of 96.51% is what decides the rewards, and the Bonus Wheel adds more chances of a win. There are up to 30 Free Spins, an extra Wild, and a multiplier of up to 5x. But if the Sandstorm Feature is activated you will have to wait until the sandstorm settles to find up to 3 whole reels turned in to Wild. 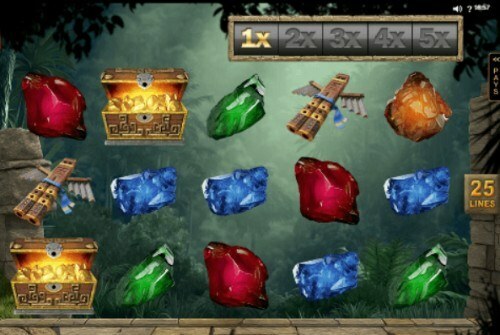 This is a online slot machine with a good balance between rewards and entertainment, and hence our ranking of it number 1 in the list of best adventure themed online slots.